This dish has a lovely old-fashioned feel to it. 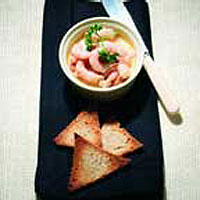 Making potted prawns is very easy but if you don't want to do so, simply use 4 pots of Morecambe Bay potted shrimps. Toast the bread on both sides, then cut off the crusts and cut the slices into triangles. (Put the bread trimmings in a bag and store for breadcrumbs.) Use a serrated knife to split each piece of bread down the middle into two slices. Place on a baking sheet and bake for about 5 minutes until dry, crisp, and slightly curled. Meanwhile, melt the butter over a very low heat (it should be just warm enough to melt, not cook). Add the prawns and the spices, stir, then divide among 4 small ramekins. Take to the table with the toast.